Today the old schoolhouse welcomes visitors rather than students and instead of desks and blackboards, its classrooms are filled with the artifacts of long-dead pioneers. Occasionally, someone will shiver for no reason and some have heard odd sounds that seem to be coming from a particular room. If a visitor asks about these anomalies and the guide is in a talkative mood, he or she will learn about a student who died in an unusual manner many years ago. Each day, a new clue will be posted until someone names the location, providing the street address, city and state (or province/country if located outside the US) and an explanation as to how each clue applies to the location. If no one correctly names the location, the contest will end at midnight (Eastern time), Saturday, September 22, 2018. Please note, the contest ends at midnight in the Eastern Time Zone. If you live in a different time zone, please make adjustments so you will know what time it ends where you are. These mystery locations are getting so hard that I'll never be able to name another one. I can't find anything relating to this one. I checked, and there are dozens of states that have time zone boundaries. 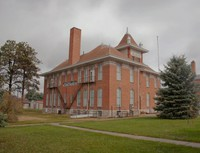 This is the Centennial Hall Museum, 3rd and Macomb streets, Valentine, Cherry County, Nebraska. The town was named after a man whose surname was Valentine, but calls itself the "Heart City" and even its street signs are red and white, traditional Valentine's Day colors. Red and white are also the colors of the Valentine High School Badgers. The Central and Mountain time zone boundary runs through the middle of Valentine, so the time changed every time you crossed the street. Now, I believe the entire town is on Central time. The old school is said to be haunted by a girl who died in 1944 after someone poisoned her clarinet reed. People claim the "odd sounds" are the girl's ghost practicing the clarinet in what used to be the old music room. Today, there are exhibits in the school rooms, such as a collection of pioneer, cowboy and other artifacts, and a room full of bells. That's because people are naming them too fast. I think I've named more than anyone else and some of them, I could have named as soon as I saw the primary clue, but I waited for a couple more clues to keep them easy. If today's clue hadn't been "Cherry," I couldn't have named this one. So why was "Cherry" so helpful? It didn't help me. Congratulations, Jason. I believe all old schools are haunted in some way, at least those from the distant past were. I doubt that even the dead would want to return to the schools of today. They all look more like prisons than schools and there's more crime than classwork. Like Jane, I've never seen red and white street signs either. Good job, Jason. I've never seen red and white street signs either.